Five great reasons to use Google Display Ads. As the design team at Shark was finishing some new display ads, we thought we'd take a moment to answer a common question that, as a Vermont digital marketing agency, we hear a lot: Why should I use Google display ads for my business? Reach – The Google Display Network is made up of over two million websites, videos, and apps where your ads can appear, reaching 90% of Internet users in the world. This includes hundreds of large sites, like YouTube or the New York Times, as well as thousands of smaller sites, many of which are frequented by your target audience. Targeting – Ads are displayed if a user searches a certain keyword, visits a website related to your industry, or meets a criteria of demographics, interests, and location. 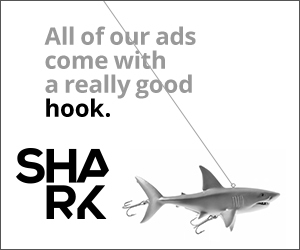 Shark works hand in hand with clients to tailor digital display ad campaigns around their specific customer personas. Positioning – The easiest way to get into a consumer's mind is to be first. Display ads are visual, engaging messages that are geared toward gaining impressions and building brand awareness. Whether you are launching a new startup or looking to keep an old brand relevant, the Google display network gives you an entry into the consumer's mind and more chance to create a branded impression than say, plain old text ads. Remarketing – What is remarketing? Remarketing takes place when a user sees your ad after visiting your website. Remarketing conversion rates actually increase over time, so the more a user sees your ads after considering your brand, the more likely they are to complete a sale. Competition – Let's be honest: everyone else is already doing it. The Google Display Network is today's digital marketplace, so if the consumer doesn't know you exist, then you've already lost. If you're looking for a certified Google Partner agency to design and manage display advertising for your business, then contact Shark today.